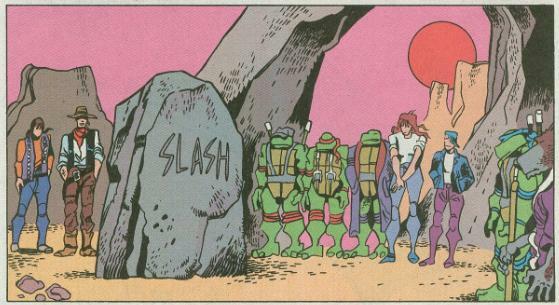 Out in the desert, the Turtles and Kid Terra’s eco group perform an impromptu ceremony for the deceased Slash. Both Future-Don and Frances give some somber words, but Raph ruins the wake with some callous talk. Future-Raph is shamed by the self-centered actions of his younger counterpart and goes off to speak with him alone. Young-Raph is equally mystified by his own behavior, but rather than admit it, asks Future-Raph to tell him how he ends up losing Ninjara. Future-Raph refuses, telling him just to enjoy the time he gets with her. Speak of the devil, Ninjara shows up and takes a seat between the two. As the sun sets, a coyote howls at the full moon and Ninjara believes she is pondering the mystery of tomorrow. At camp, a time-slip opens up and out come Future-Leo, Future-Mike and a young Japanese woman. Future-Don is relieved that his brothers were able to find them, as without their time-slip remote, they’d have been trapped in the past. Future-Leo introduces April to Nobuko… her great granddaughter. April is shocked. Future-Don is likewise shocked when he learns that the great flood that destroyed much of the Earth in his time was not stopped by the defeat of Maligna. Apparently, in the history his future stems from, Maligna invaded Earth and killed the Mutanimals herself and the subsequent battle that led to her defeat accelerated Earth’s global warming, leading to the great flood. Future-Don now realizes that the flood had nothing to do with Maligna; Mankind did it to themselves all along. Kid Terra, though, is melancholy for another reason, as this is the first he’s heard of the Mutanimals dying. Future-Leo attempts to console Kid, telling him that it was just their destiny to give their lives in the battle against Maligna, one way or the other. The next morning, Splinter and the old Indian janitor share a telepathic communication as they contemplate the day ahead. The old man tells Splinter that in a past life he was an owl and will be so again, which is why his name is Sleeping Owl. Splinter tells Sleeping Owl that he was once a man. They rejoin the group and bid farewell to the Future-Turtles and Nobuko, who return to their time and place. Sleeping Owl telepathically asks Splinter if his sons were once men, too. Splinter explains that they were baby turtles who became man-like and are growing more-so by the day. This reminds Sleeping Owl of a story and he asks the Turtles to listen. It is the story of the Earth’s creation. In the beginning there was only a great empty sea and the Maker. The Maker created the Holy People, a group of deities who lived amongst the stars over the sea. He then planted three seeds in the great sea and they became Water Beetle (the swimmer), Beaver (the builder) and Turtle (the mother). One day, a Star Person fell asleep while watching over a Star Tree and both fell toward the great sea. Water Beetle quickly began bringing mud up from the bottom of the sea and placed it on Turtle’s back. Beaver then used his tail to pat down the mud and form it into a continent for the Star Person and their tree to land on. The Star Person then planted the tree which gave life to the continent they now live on, called Turtle Island. Raph finds the story mellowing and thanks Sleeping Owl for sharing it. He then thanks Kid Terra for everything he and his group have done to help them. The gang then decides it’s time to get going as a coyote howls in the distance. Elsewhere, Water Beetle and Beaver (dressed as doctor and nurse) tell their patient that they have done all they can do to help her. They say that all she can do is rest and wait. The patient is revealed to be Turtle, hooked up to life support systems. In terrible pain, Turtle begs them to give her something to ease her suffering. Meanwhile, the Maker, who is all, feels a small part on his side suddenly begin to ache. *This story is continued from TMNT Adventures #60. For the Future-Turtles, the story continues in TMNT Adventures #62. For the present day Turtles, the story continues in TMNT Adventures #67. 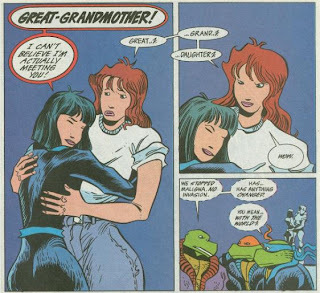 *Future-Raph warned present-Raph about losing Ninjara in TMNT Adventures #44. *The Future-Turtles’ time-slip remote was destroyed in TMNT Adventures #57. 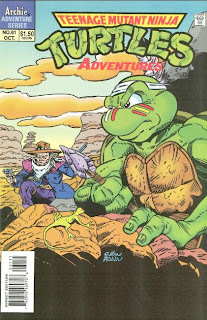 *This issue contained two bonus pin-ups: Michaelangelo vs. Leonardo by Dan Seneres and Bill Fitts, and the Mighty Mutanimals in Heaven by Mike Kazaleh. *Incidentally, the Mutanimals in Heaven pin-up seemed to have been commissioned to soothe young readers who saw a vision of the Mutanimals burning in Hell in TMNT Adventures #56. After the chaotic fury of events running successively through “Megadeath”, “Terracide” and “Blind Sight”, we finally get our breather issue as the characters are afforded a moment to relax and reflect on all they’ve experienced and all they’ve lost. Murphy (Clarrain) uses the opportunity to give us various insights on the characters before transitioning into a second narrative more befitting of his “World Tour” arc from some while ago. We receive a brief history lesson on American Indian culture (I’m assuming Nahuatl, as that’s the tribe Frances says she is descended from, but Sleeping Owl never states the exact origins of his creation story) as well as some of the standard environmental finger-wagging. The character segments were my favorite moments of the story, as Future-Raph is irritated by the self-centered behavior of his rebellious teenage incarnation (ruining a friend’s wake: Not Very Classy), Future-Don laments the pointlessness of everything he tried to do by coming back in time in the first place and Kid Terra learns for the first time that his Mutanimal friends are dead. The introduction of Nobuko didn’t carry much weight to it; more like it just gave April something to say and do where she would otherwise have been silent (Candy, again, is reduced to a face in the crowd). Splinter and Sleeping Owl sharing their philosophies and their own “reincarnation” experiences offered some interesting reflection (and we get more insight on Splinter’s fatherly sorrow that his kids are growing up). Now, the second half of the story is the creation myth segment. 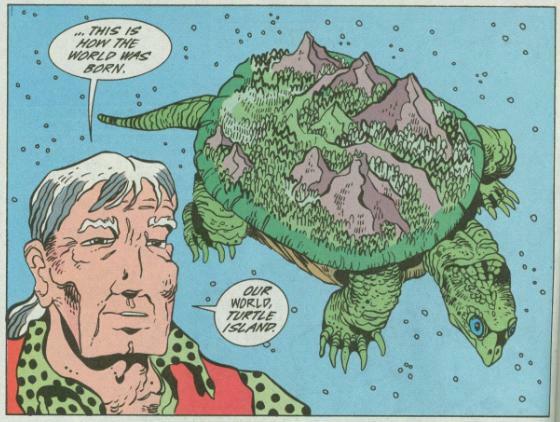 It seems rather shoe-horned in, with only the concept of a Mother Turtle relating it to the comic in any coherent way, but it was a nice reprisal of the cultural history lessons that Murphy often gave when he did the “World Tour” arc. I always liked those issues, even if this one wasn’t quite as congruous with the storyline as the others. But then we get to the heavy-handed environmental themes, lectured to us through an American Indian character who is an authority on the subject. 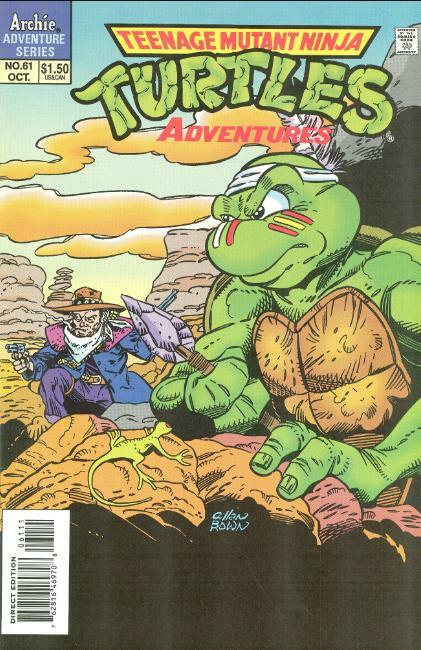 Murphy seems to have something of a hard-on for American Indian culture, as many environmentalists in America tend to, and that obsession seeps through not only in his Archie and Mirage TMNT work, but also in books like “Puma Blues”. He seems to have “drunk the Kool-Aid”, so to speak, in regards to that old myth that American Indians lived in a utopian society before the arrival of whitey, with no concept of property or ambitious environmental modification of any kind. How exactly that perception of the American Indian tribes as this hippy-dippy master race gels with documented cases of tribal warfare over territory (no concept of property, indeed) or the ruins of huge city structures carved into mountainsides or built in clear-cut stretches of land… Well, that sort of thing is just inconvenient to think about, I guess. Murphy must have a whole lot of White Guilt goin’ on, the way he’s constantly gushing about the superiority of American Indian culture. Sorry about the tangent, but it’s just an irritation of mine. Political correctness and the inherited guilt of our ancestors has caused modern day American media to revere Native American culture and history to a rather dishonest degree. It doesn’t do anybody any favors by romanticizing their culture and history into an exaggerated stereotype that never truly existed (we’ve gotten over our misinformed fantasies of cowboys being these white-hatted heroes of the West, so maybe we should start putting the Indians under a proper historical microscope, now?). Cant wait for your reviews of the cyber turtle arc!!! I never could figure out what the cover was supposed to mean either. As a kid, it was a real shock going to Jim Lawson's "intermediate" style after such a heavy diet of Chris Allan. Agreed; I was never a fan of Lawson's work back in the day. I appreciate it more as I've grown older, maybe even matured in some way, but at the time? Allan was the absolute top for me, and I didn't like others taking over.